Superstars Rajinikanth, Akshay Kumar and director Shankar were in Hyderabad on November 26 to promote 2.0 movie. They addressed the media in its pre-release event, which is part of its publicity. Written and directed by Shankar, 2.0 is a science fiction action film and its promos show that it is set to be an extravagant visual action thriller. The movie is released in three languages like Tamil, Hindi and Telugu on November 29 and the film unit is busy promoting it on various TV channels across the country. The team of 2.0 visited Hyderabad for the publicity of its Telugu version. The press meet started at 6.00 pm on Monday and Rajinikanth, Akshay Kumar and Shankar answered questions related to the production and promotion of the movie. This press conference lasted for two hours. 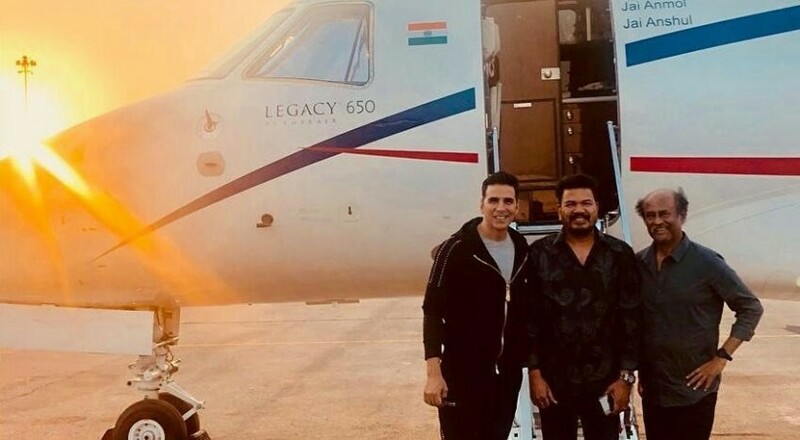 PRO Vamsi Kaka tweeted, "Superstar Rajinikanth, Shankar & Akshay Kumar will be coming to Hyderabad today evening to interact with Telugu Media #2Point0 The Team #2PointO is all set to interact with the media Today. Get Ready To See #GrandPressMeet Today from 4:30 pm onwards. #2PointOGrandPressMeetToday! @2Point0movie #2Point0FromNov29 @rajinikanth #akshaykumar #shankarshanmugh @arrahman @iamAmyJackson @resulp @LycaProductions." The movie 2.0 serves as a spiritual successor to Enthiran (2010) and S Shankar has co-written the script with B Jeyamohan for the movie, which has been produced by A Subaskaran under the banner Lyca Productions. The flick has been made with an estimated budget of Rs 543 crore and it is the most expensive Indian film made to date. The makers of 2.0 have kept the details about its story under wrap. But if we are to go by the reports, Dr Vaseegaran is settled in a foreign country after dismantling robot Chitti. But he reassembles his robot Chitti, when a deadly evil poses a huge threat. How he fights the monster to save the world forms the crux of the world. Rajinikanth is playing the roles of Dr. Vaseegaran and Chitti, which he reprised in the first instalment. Bollywood superstar Akshay Kumar is seen as a deadly evil, while Amy Jackson plays the female lead in 2.0. Sudhanshu Pandey, Adil Hussain, Kalabhavan Shajohn and Riyaz Khan are seen in the supporting cast of the movie, which has AR Rahman's music and Nirav Shah's cinematography.